Given that these two bridges are tasked with spanning the waters that serve one of America's busiest ports, you would think that the length and the grades would be the biggest challenges to a person on a bicycle. 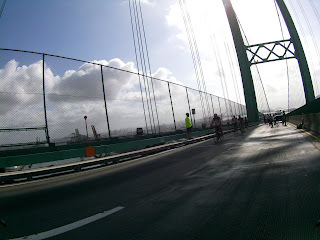 The Gerald Desmond bridge, which is the smaller of the two, proved surprisingly easy to cross even at only a moderate cadence and without dropping into the smaller chain ring. In fact, there were people who made it across this bridge riding beach cruisers, fat bikes, even a Dahon folding bicycle. Sure there were varying degrees of effort put in, but nobody seemed to be all that daunted by the task. The Vincent Thomas was a much longer and notably steeper ride, but even then, the majority of people were able to stick it in a granny gear and spin their way across. Now normally, I drive our car or ride my motorcycle across these bridges, so I hardly give it a second thought from a cyclists perspective since bicycles are not permitted to travel this road, since it is designated as being part of a freeway. However, on this rare occasion, I got to experience for myself the vast difference in thinking that goes into designing a bridge solely for a single class of users versus one that might be multimodal. With no walkways to speak of and a surprisingly grippy road surface, it is clear that this road is not intended for any form of pedestrian traffic. Probably the single most intimidating aspect of the bridges were the expansion joints. Since Southern California is well known for its earthquakes, all major roads are built with extra attention paid to allowing the road to expand and sway. While these structural elements are common in areas that see temperature extremes, in California, they are over engineered to ensure that a bridge as large as the Vincent Thomas is easily able to withstand a little sway. Again, in a car, these expansion joints present little to no hindrance to the journey since car tires easily cross over them without issue. However, on a super skinny bicycle tire such as those on the road bikes that most riders were using, catching the joint at the wrong angle has the potential to send a rider flying off the bike. Unfortunately, precisely that scenario has happened before, resulting in the unfortunate demise of the cyclist. Luckily, for the event, we did not have to worry about that as traffic was prohibited from traveling the bridges in the westbound direction and all of the expansion joints had a section covered with a large piece of 4x8 plywood and some carpet. That allows the bike tires to roll easily across without issue. Cresting over the apex of the bridges, rolling down the grade saw some riders cruising up to as much as 30 mph. It might not seem like that much speed, but keep in mind that this is mostly people wearing little more than a thin layer of polyester and riding on tires barely wider than an adult's finger. Traveling that fast when so exposed to the elements is insanely fun, but can definitely be frightening for someone who is not used to such speeds, especially on a single track vehicle. Of course, the remainder of the ride was rather unspectacular by comparison since riding through the Port of Los Angeles and even the boat ride back to the Queen Mary paled in comparison to riding across a major landmark such as the bridge made famous by the movie Gone in 60 Seconds. Both the original and the later remake featured the Vincent Thomas bridge quite prominently and it was the scene of one of the major stunts. Using this as a way to kick off our own National Bike Month was certainly a fantastic opportunity that we could not miss. As the Gerald Desmond Bridge is being replaced with a new one that will include new cycling infrastructure to connect Downtown Long Beach and the Port of Long Beach, it becomes increasingly evident that the lack of a means of accessing San Pedro from Terminal Island is a glaring hole in the patchwork that makes up the local biking network. Connecting Downtown Long Beach via the Port of Long Beach and Port of Los Angeles with the path that runs along the ocean in the Palos Verdes Peninsula and on through the Beach Cities all the way through Santa Monica would be a tremendous win for recreational cycling infrastructure in Southern California. And connecting both ports would be a huge win for commuters who would now have an alternative to risking the dangerous conditions if they wish to bike.